The FAA has given approval to three Tecnam enhancements for the P2010 4-seater, including updated avionics and an alternative to 100LL fuel. Those enhancements include offering an integrated GFC 700 autopilot to go along with the G1000 flight deck, which is standard in the P2010. A second option, the Garmin G500 avionics suite, will lower the overall cost of the plane, and certification to use MoGas will help cut operating costs. The critically acclaimed GFC 700 is an AHRS-based automatic flight control system that provides flight director, autopilot, automatic and manual electric trim capabilities, bringing a high level of digital sophistication to GA flight controls. Approval of the Garmin G500 suite gives Tecnam 2010 owners additional options. The new G500 configuration also includes an EIS System based on the EDM930. Primary COM/NAV/GPS is the GTN 650 touch-screen navigator, while the secondary COM/NAV source is the Garmin GNC 255. A GTX 33 remote mode-S transponder is controlled via GTN 650 touch-screen display, with ADF and DME available as optional NAV aids. The P2010 was originally designed to offer customers a non-100LL fuel alternative. Tecnam chose the Lycoming IO-360M1A to power the four-seater, mainly as a result of its capability to burn alternative fuels. 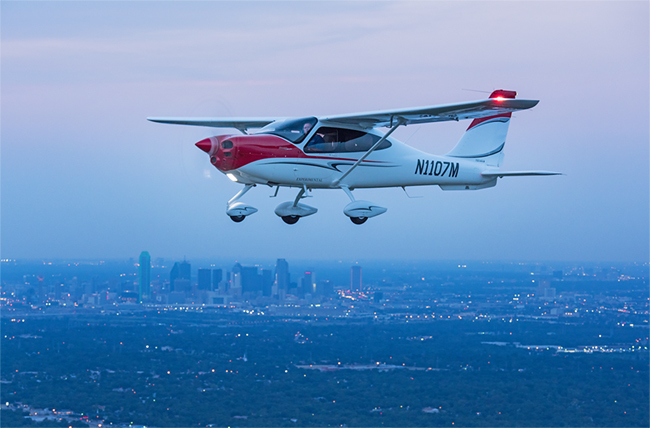 FAA approval makes Tecnam the first worldwide aircraft manufacturer able to obtain such a wide, flexible and non-single-brand-related choice, as well as the first GA manufacturer capable of obtaining approval for use of automotive fuel on IO-360 Lycoming engines. The company reports that all of its airplanes can use lead-free gas now. Get more information at tecnam.com.